Unlike all other manufacturers, DEC has all the key technologies for the design, engineering, production and service of high performance continuous casting moulds. This unique combination of expertise and long-standing experience in the field makes us a highly qualified partner in all mould-related questions that arise. 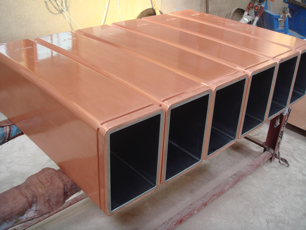 DEC’s copper mould tubes that are designed based on your specific needs and operation conditions on-site. Our engineer team is able to help you to identify the problems in your current casting process and revise the mould tube taper as per the casting conditions up to date. DURACO® is the special multi-coating technology that DEC has for the mould tube inner coating. Comparing with the traditional Cr coating and other multi-coating that appears in the market in recent years, DURACO® coating has better performance, and it has been proofed in the market.